The largest port complex in Latin America forecasts moving 120.6 million tons of cargo thanks to the expected record 2016-2017 grain harvest in Brazil. 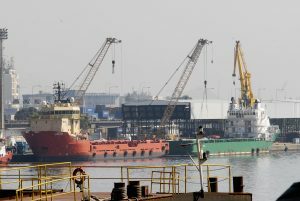 SÃO PAULO, BRAZIL – Although Brazil’s economy has not yet recovered from the worst recession in decades, the Santos Port, largest port complex in Latin America, is forecasting to move a record 120.6 million tons of cargo in 2017, according to Companhia Docas do Estado de São Paulo – CODESP (Santos Port Authority). Port of Santos expected to register record movement of cargo in 2017, photo by Tania Rego/Agencia Brasil. “This expectation will imply an increase of 6.3 percent compared to the expected result for 2016,” said CODESP’s CEO Alex Oliva in a statement released this week. If confirmed it will be the third largest result ever recorded, behind only the volumes registered in 2015 (119.931 million tons) and 2013 (114,077 million tons). Port officials estimate exports will increase by 8.2 percent (89,000 million tons) and imports by 1.3 percent (31,596 million tons) this year. The bulk solid products (60,698 million tons) are expected to register a 12.1 percent increase while bulk liquids (15,882 million tons) are expected to increase by 1.2 percent and the general cargo (44,015 million tons) by 0.9 percent. According to CODESP director Cleveland Lofrano the port will tend to benefit from the expected increase of the 2016/2017 grain harvest and sugar production. After a 10.7 percent decline in the previous harvest, 2017 harvest estimates point to a 15.3 percent increase in Brazil’s grain harvest (totaling around 214.8 million tons. For Lofrano due to higher prices, higher international demand and more favorable climatic conditions, Brazil’s soybean harvest, part of which will be exported abroad through the Santos Port, is expected to register a new record, with an estimated average growth of 9.0 percent (totaling 104.0 million tons). CODESP estimates that the cargo movement through the Port of Santos totaled 113.475 million tons in 2016. “This volume, despite representing a reduction of 5.4 percent in comparison with the one calculated in 2015, mainly due to the significant decrease in corn shipments, was conducted in an adverse global economic scenario, showing the good performance of the Port of Santos, even in adverse situations,” concluded Oliva.